The lowly corner filter (or as it is sometimes called, the box filter) gets little recognition these days. Once the mainstay of the hobby, it is used mostly in quarantine or fry tanks, if at all. However, this page is here to tell you about the virtues of this wonderfully low tech method of filtration. This page was written for those aquarists who are already familiar with basic filtration concepts. If you are not familiar with them, please read the materials at the Filtration FAQ first. (Use the link near the end of this page). There are two basic types: a "standard" type, those designed to be used without airstones, and a "deluxe" type, those driven by airstones. The type without airstones are very inexpensive (one of my aquarium supply catalogs lists the Lee Economy model for $1.99!). However, I don't recommend this type, in that it suffers from a lower flow rate and can be far noisier than the airstone driven type. The large bubbles produced also agitate the water in a more violent fashion (hence the greater noise). Contrast this with the gentle flowing of the many small bubbles generated by an airstone. 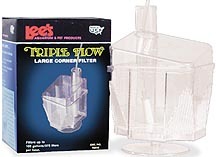 The Lee Economy Corner Filter: an example of the simple (non-airstone) type of corner filter. There is another type of filter that sometimes goes by the name "corner filter". This is the Penn Plax Clear-Free Corner Cartridge Filter and its clones. It does not share most of the desirable characteristics of the corner filter that I know and love, and my remarks here are not applicable to them. The corner filter works on the principle of an "air lift". A stream of bubbles moving up a tube also pushes water up with it. Water flows into the top, sides or bottom vents of the filter to take its place. As the water flows through the filter, it passes through filter media. This "air lift" is the same mechanism that draws water through an airstone driven undergravel filter. Inexpensive to obtain and operate. They just don't cost very much. Even the largest one will cost about $6 via mail order. Since you are buying media in bulk, your supplies are purchased at the lowest possible unit cost. A fairly high quality air pump (which has repair kits available) of adequate power will cost about $6. Easy to maintain Though they are nowhere near as quick to change filter media as with some outside power filters, they are nowhere near as troublesome as a canister filter. Versatile in terms of filter media See the discussion below about filter media. Simple in design and therefore (close to) foolproof. Anyone who has tried to deal with a noisy or stuck impeller will appreciate the simplicity of this filter. The most complex part of the system is the air pump, and that is often so inexpensive that you can afford to stock a back up in case of problems. Aerates the water An airstone driven corner filter provides more aeration than most powered filters. Less effected by power outages Any filter that keeps its biological filter media immersed in a larger body of water is not much effected by short power outages: the bacteria will be in a larger body of water (in the tank versus in the filter chassis) and will therefore be subjected to less stress. Air pumps merely start up again when the power comes back on and there is no loss of siphon, etc. Battery powered air pumps are available for use during a prolonged power outage. Less violent water movement Since there is no falling water, spray bars, etc., corner filters can be used in situations with fragile tank inhabitants (such as fry tanks). Takes up habitat space in the aquarium. In a smaller aquarium, this may be a real issue. Tanks with smaller footprints (tall hexes for example) may not be able to afford the space taken up by this filter. Slightly inconvenient to maintain. It's simple to maintain, but you do have to yank it out of the water, which may get your hands wetter than you would like. If your tank is deep, you may have to get your arms (not just your hands) wet when you set it back in. May be less durable than hoped for. Some of the cheaper import "no name" brands may be made of a plastic that turns brittle. Difficult to pack. Those models with odd shaped media chambers may be difficult to pack. See Media, below. Vulnerable to attack by large aggressive fish. It's right there in the habitat - and there is not much you can do to protect it. Not suitable for large aquariums. I had to think about this one for a while. Sure, with today's air pumps, you could set up a three Lee Triple Flow models with turbo thinwall tubing for a 6O gallon tank, and it would work, but in that situation you are better off with a power filter of some sort. I think. Let me make some comparisons to other types of filtration. A most likely rival for a low cost set up is the conventional flow undergravel filter (UGF). Both the corner filter and the UGF are air lift driven, that is, they both use air pumps to move water. The UGF has an advantage in that since it is covered with gravel, it is mostly out sight, making a better appearing aquarium. However, the big trade off is that a UGF will have a problem with the accumulation of mulm (crud) underneath the filter plate. No matter how conscientious you are about vacuuming the gravel, you will still need to clean under the plate. This can be done with a periodic (say, once or twice a year) major tank "tear down", or by trickier methods which involve either periodically forcing water down the lift tubes or vacuuming under the plate via the lift tubes (see links for further info on these methods). Contrast this with the process of cleaning out a corner filter: lift it out and clean it out, with little disturbance to the tank and its inhabitants. I happen to like UGF's but I only use them on very small tanks that are easy to tear down. Also, a UGF is poor at offering chemical filtration options. For mechanical filtration, it performs too well, leading to the above mentioned cleaning problems. Much of the aquarium hobby seems to be driven by a boyish fascination with hardware (it is a male dominated market). I admit to having this same fascination, but my fascination is with the simpler devices as well as the high tech ones. Thus, a fascination with biowheels and fluidized beds and the like can lead to some excesses. If I can keep my ammonia and nitrite levels undetectable with a low(er) tech filter (be it a corner filter or a Whisper 2 with some Bio Chem Beads), what's the rationale for spending more money on a cannister/biowheel/fluidized bed/trickle filter setup? The more complicated and higher tech the set up, the more serious are the possibilities of problems (canister filters sometimes stop undetected, biowheels cease to turn, and fluidized beds crash or eject their sand, and big trickle filters break their siphons or overflow). I'm not totally against these innovations - I would just like aquarists to keep all the possibilities in mind. Please consider my remarks here a form of mild advocacy for corner filters; only you can decide what filter is best in your situation. The media chamber of a corner filter can be relatively large, but your choices of filter media are all very much influenced by the fact that there is often an air lift tube running through the center of the chamber. This may lead to the situation where water will bypass the filter media. (Bypass is a big no no for some people - one of the big selling points of canister filters is that they prevent bypass). Of the different media, bypass is far less likely to happen with the mechanical filter media; it may occur to some extent with the chemical or biological media, However, there are ways to deal with the bypass, and please note that many of the other filtration systems also allow for bypass. The following is a rundown on the options for the different media. Please keep in mind that some media will perform more than one of the these functions. Mechanical filtration media. The medium of choice is filter floss, purchased in bulk bags, the biggest bargain in filter media today. Be careful not to pack it too tightly. Filter pads might be cut to fit, but due to the positioning of the air lift tube, this is probably not worth it. Sponge (foam) may be used as well, but it would also have to be cut to fit. Chemical filtration media. Here we have to deal with the problems of the shape of the media chamber and with bypass. Chemical media is usually in the form of small granules (activated carbon, chemical beads, resins, etc.). The best way to distribute this media is to put down a layer of it in the water flow after the mechanical media. Unfortunately, this makes for a messy cleanup; I prefer to put it in a loosely packed filter bag. Having it loosely packed allows me to distribute it in the media chamber a bit better. The bag helps me to keep some semblance of control over where this stuff goes (and I can live with the bypass). Biological Media. Note that most any media (floss, sponge, carbon, etc.) will become biologically active if left long enough in the water flow to grow the requisite bacteria. The old time method with using just carbon and floss was to discard only half of the dirty floss at maintenance time so as to maintain biological filtration. So in addition to mechanical media which you may use as biological media as it ages (but be sure to clean it so as to prevent clogging) certain types of biological media are best. Due to the relatively small size of the media chamber, commercial bio media that comes in small pieces are good. Cell Pore Bioblox cubes, Eheim Efisubstrat, Seachem Matrix, etc. fit this bill. Some people even use gravel. However, unless you put these in a filter bag, you may find them hard to manage come maintenance time. The biological media of choice are ceramic "noodles" (Biomax Rings, Filstar Ceramic Rings, etc.) loosely strung together with monofilament fishing line. They are relatively small, and being loosely strung, the media can be distributed about the chamber, while also allowing fast removal. It is possible to get a better water flow by increasing the volume of the "air lift". This can be achieved by fitting a longer lift tube to the top of the filter where the bubbles come out. The problem is getting a tube that fits. Of the Lee "Triple Flow" models, only the "medium" sized one can take 1 inch thinwall. Since it is standard sized thinwall as used on UGFs, you can then replace this with a longer length of tubing and cap it off with the "elbow" part of the UGF lift tube assembly. I prefer the Perfecto brand elbows. The elbow produces a more "directional" flow as the water exits the filter. In their heyday, there were turbo models that featured media chambers without lift tubes going though the center, and media chambers that could be lifted out of the tank without disturbing the rest of the filter. In packing the filter, remember that mechanical filtration should be first in the flow of water, followed by either chemical or biological. Air lines should have a check valve (which prevents water from flowing out of the aquarium and into the air pump in case of equipment or power failure). Air stones suitable for UGF's are appropriate. Air stones can sometimes vary in quality in that some allow more air flow than others - replace any that do not flow well upon initial set up. Use an air pump powerful enough to produce a large amount of bubbles. I have read that air pumps should properly be set up with a gang valve with at least one open (unused) valve to bleed off excess pressure, but I have never bothered. Whenever you approach the aquarium, take a quick glance at the filter to see if the flow of bubbles is still plentiful. Do filter maintenance at a decent interval (once a month or sooner: this is a judgment call) by replacing or cleaning out mechanical media, replacing chemical media and less frequently, cleaning the biological media. Biological media (and this includes mechanical media that is doubling as biological) needs some care when cleaning: in order to not kill off the bacteria, rinse gently in about-to-be-discarded tank water (do this during a water change so you have some of this water). Remember that it is quite all right for biological media to "look dirty". You are only cleaning it to prevent clogging and to remove an outer layer of bacterial growth from time to time. Also, be sure to clean out the intake vents. Air stones. Air stones tend to load up with hard water deposits under my tap water conditions; they also may get coated with slime. Dirty air stones can be refurbished by cleaning with an algae scrub pad and a soaking in a strong bleach solution. However, with small air stones selling for as little as $1.49 for a packet of four, you might want to consider them disposable. Check valves. Depending on the quality of your check valves, you may wish to replace them every year or so. You can test them by blowing on them (yuck!) in the direction of air flow that they are supposed to block. Air Pumps. Inexpensive air pumps may be replaced periodically, or if you have an aptitude for working with small machine parts, you may consider replacing flappers and diaphragms as needed. I have found that rotating individual air pumps in and out of service seems to refresh some of them: the period of disuse seems to allow the moving parts to reform themselves. Airline. Cheaper quality airline will harden with age and may become brittle. Check the airline periodically for signs of deterioration. A high quality standard tubing, such as Python brand, or a silicone tubing is a good long term investment. It is vitally important for an aquarist to understand the establishment of the nitrogen cycle (biological filtration) in a new tank. See Beginner FAQ: The Nitrogen Cycle for an explanation. The Undergravel Filter Controversy talks about problems with UGFs. About.com's Guide Picks - Top Box (Corner) Filters is a buyer's guide to brand name corner filters. Dewey, Don (ed). For What It's Worth Volume I. Sierra Madre, CA: R/C Modeler Corp. 1985. This is a compilation of the best of the reader submitted tips from the monthly "For What It's Worth" feature of Freshwater and Marine Aquarium Magazine (FAMA). Volume one has tips from the days when corner filters were common - you can see how to make them from plastic funnels, disposable clear plastic cups, and plastic food containers. There are also instructions for modifying standard (non air stone driven) models to use 1 inch lift tubes. Owstrow, Marshal E. Goldfish; A Complete Pet Owner's Manual. Hauppauge: Barron's Educational Series, 1985. This book describes using corner filters that have been modified into "turbo" models and has a very enlightened explanation (for the time) on how media can become biologically active.